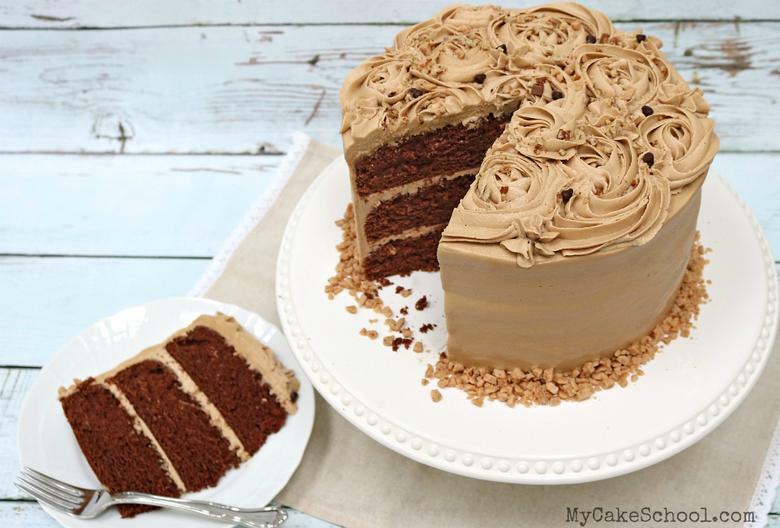 If you are a fan of the combination of chocolate and coffee, you are going to fall in love with this moist and flavorful Mocha Toffee Crunch Cake! Once upon a time we posted a recipe for a simple Coffee Toffee Ice Cream Cake. I’ve made this ice cream cake more times than I can count over the years, and with it’s heavenly combination of coffee, toffee, and chocolate, it is ALWAYS a crowd pleaser. We are so excited to now have a cake that incorporates this same fantastic combination of flavors. 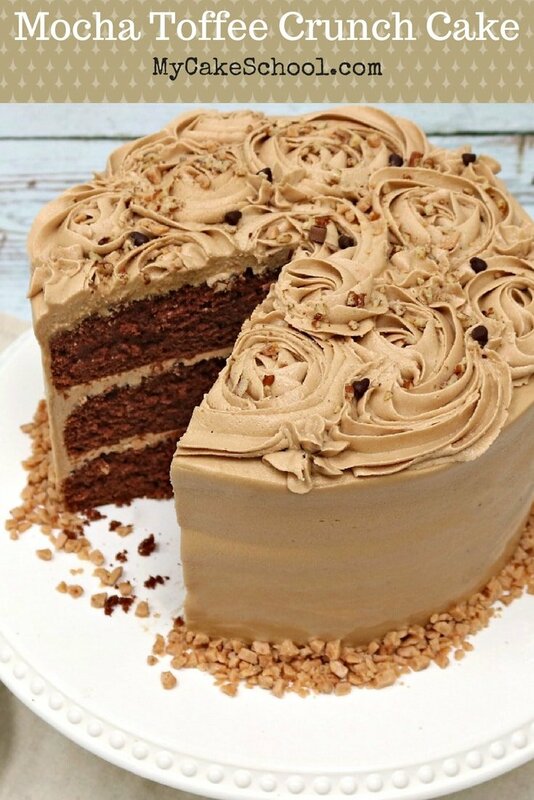 Our Mocha Toffee Crunch Cake consists of rich chocolate cake layers sprinkled with pecans and toffee, and a Mocha Buttercream that has just the right balance of espresso and chocolate! For this recipe, we used our Classic Chocolate Cake recipe, but it would work well for whatever your favorite chocolate cake may be. If you are a fan of doctored cake mixes, our Chocolate Sour Cream Cake- Doctored Mix is a great option! 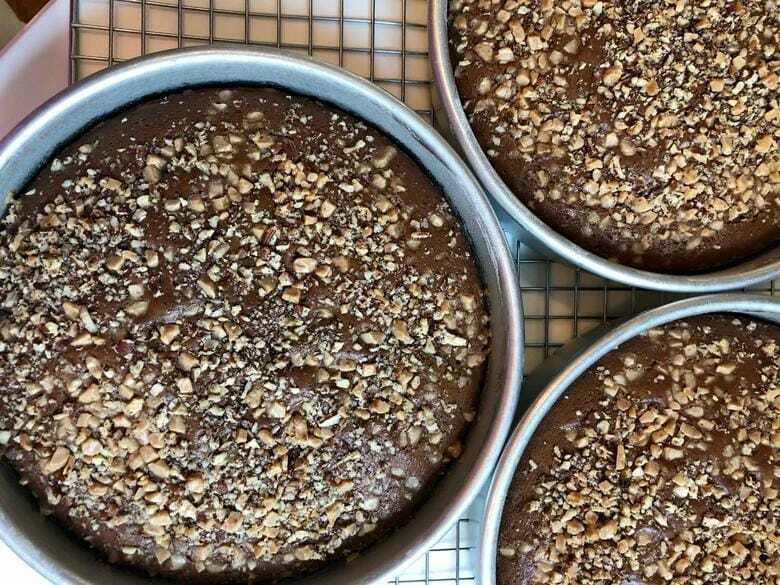 What makes these chocolate cake layers even more fabulous is that we sprinkled the batter-filled pans with toffee and pecans just before baking. I love the flavor and crunch that this adds! …and here they are fresh from the oven! 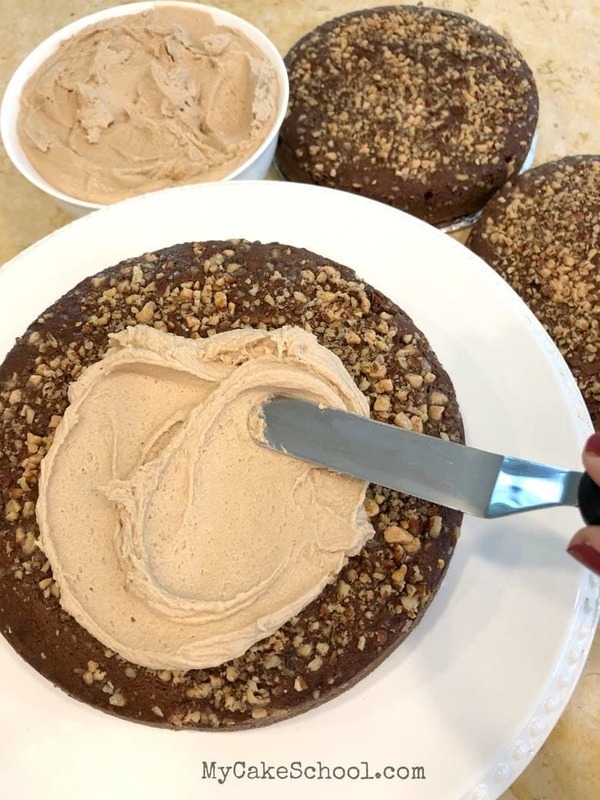 When assembling the cake layers, we frosted mocha buttercream frosting onto each layer and followed with another sprinkling of toffee bits and and chopped pecans before adding the next layer. We hope that you enjoy the recipe! If you would like to make a cupcake version, I would recommend our Classic Chocolate Cupcakes, which use the traditional method of mixing, making a fluffier cupcake! The chocolate cake recipe that we used for this recipe calls for the Reverse Creaming Method of mixing. Although the order of ingredients may seem a little strange at first, you are going to love the final results! Cakes that are made with this popular method of mixing result in a slightly denser, velvety, melt-in-your-mouth texture. If you are new to this method, you may be interested in watching our free video here: The Reverse Creaming Method of Mixing. 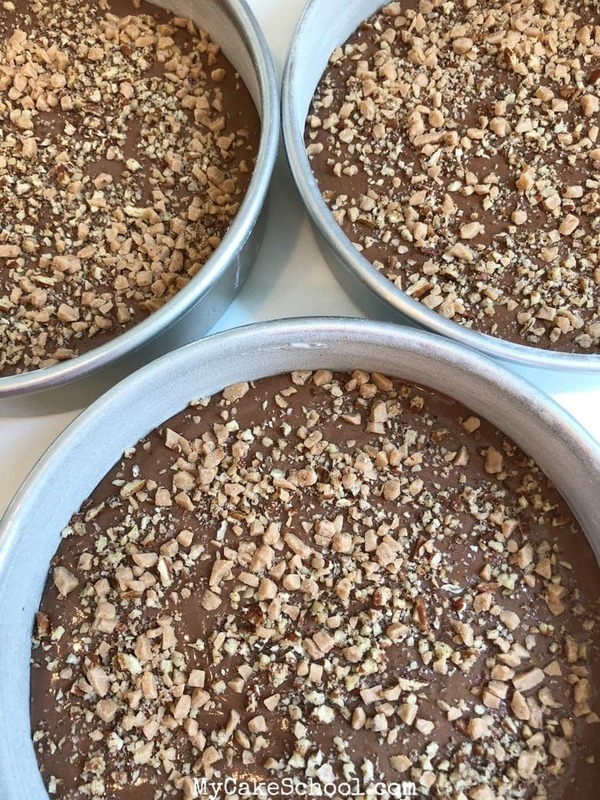 If you love cakes with a hint of espresso (like me!!) 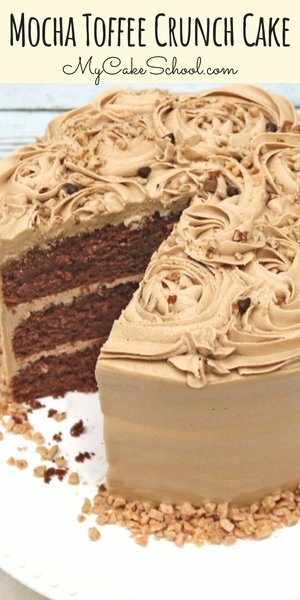 , then you must also check out our DELICIOUS Caramel Vanilla Latte Cake recipe! This homemade cake has the perfect balance of vanilla, caramel, and espresso. Mmmmmm… I could never choose a favorite. I highly recommend making them both! Once the batter is in the pans, sprinkle about 1/2 of the pecans and toffee bits over the top of the batter. The remaining pecans and toffee will be sprinkled over the mocha buttercream filling when assembling the cake. You can increase the amount used if you would like more crunch. bake at 350 degrees for 25 to 30 minutes or until the center of the cake springs back to the touch and a toothpick comes out clean. Beat the butter on medium speed until smooth. Blend in the vanilla and cocoa powder and salt. Add half of the powdered sugar and half of the coffee. Beat at medium speed until the powdered sugar is incorporated. Add the remaining powdered sugar and coffee and mix at medium speed another 3 to 6 minutes scraping the sides of the bowl occasionally. This recipe makes 6 cups of frosting. This is enough to fill, frost and add a moderate amount of decorative piping on a 3 layer 8 inch cake. If your consistency is too thin, add more powdered sugar. If too thick, add a bit more water or milk, a teaspoon at a time. If you are interested in learning even more about cake decorating, don’t miss our Free Cake Tutorials section! In addition to cake recipes, you will find hundreds of step by step cake decorating tutorials as well as Free Cake Decorating Videos! Finally, if you’d like to be able to access our entire library of cake decorating video tutorials (we’ve made hundreds over the years)- you should consider joining us as a member! You can find out all of the details here- we would love to have you! Joining Information for MyCakeSchool.com! THANK YOUUU for listing how many cups of batter & frosting this yummy recipe yields! It helps so much when considering different sized tiers! Hi Beth, You would use it in place of the instant espresso coffee. I have read that 1 teaspoon emulsion is equal to 1 teaspoon extract. You will still need the 1/4 cup water ( you could also use milk ) to thin the buttercream. I would make the buttercream adding 1 teaspoon emulsion. Taste, then add additional emulsion 1 teaspoon at a time as needed to reach the coffee flavor you like in the mocha frosting. Below is the link I referred to for information on emulsion. I am a new baker and made this. It was easy and really good! Very light. The next time I make it I will add more toffee bits. I made a strong attempt to decorate it like the picture but lets just say, no one judged my book by its cover. I had very willing participants to eat it all up. Hi Laurel, I’m so happy you enjoyed the recipe, thanks for giving it a try. You are a new baker so don’t worry that something doesn’t look perfect, we are always our worst critic. Be patient, practice will improve your piping skills. The important thing is that your friends enjoyed the cake. Thanks so much for posting a review.